In the coastal town of Brunswick, Ga., posters decorate the many shrimp docks along Bay Street: “Warning: Asian Tiger Shrimp,” they read. “Please keep an eye out for tiger prawns.They are big and black, with whitish-yellow stripes.” A blown-out photo of a giant black sea creature covers the sign. Lindsey Parker, who designed the poster and has distributed it throughout coastal Georgia, South Carolina and Florida, is captain of a research vessel called the Georgia Bulldog and a marine resource specialist with the University of Georgia’s Marine Extension Service. He is on the water as many as 120 days a year. And he’s trying to amass better numbers on the predatory Asian tiger shrimp in the Gulf of Mexico and Southeast coastal waters. 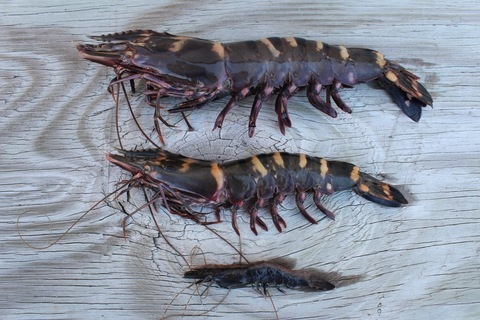 The Asian tiger shrimp, or tiger prawn, can reach the length of a human forearm and weigh as much as 11 ounces. Scientists fear that they are crowding out the region’s native shrimp for food, since they’re aggressive and known to prey on smaller crustaceans. They also carry pathogens, such as the white spot syndrome virus and the yellow head virus, both known to harm native white shrimp in captivity. What’s more, the creature shines a harsh light on the dangers of the aquaculture facilities from which they may have escaped. While it’s hard to pin down total numbers, the shrimp are likely here to stay, said James Morris, an ecologist with NOAA’s National Ocean Service and the National Centers for Coastal Ocean Science. He says they’re on the verge of becoming “established,” at which point they’ll be nearly impossible to remove from the water. “We believe they are established, but we don’t know their total mass because of the difficulty of monitoring abundance,” Morris said. How they arrived in the Gulf is not entirely known, but many scientists believe their first grand exodus occurred in August 1988. That’s when more than 2,000 animals are believed to have escaped from the Waddell Mariculture Center in South Carolina, according to the U.S. Geological Survey. Some 300 were caught in open water over the next six months, but then their numbers dropped off. In 2006, a hurricane in the Caribbean likely led to the further release of the animals from an aquaculture center in the Dominican Republic. Aquaculture facilities are land-based sites that conduct research, farm seafood and operate along the coast where there’s easy access to water. Most of the animals raised there are non-native, a potential threat in the event of an escape. Ray Bauer, a biology professor at the University of Louisiana, lists the dangers of farming non-native species. Hurricanes and storms, he said, are common causes of accidental release from aquaculture facilities. He points to the water hyacinth, an invasive plant, and the Asian carp, which was introduced into the Mississippi River during a flood and traveled quickly up to the Great Lakes, where it’s now “wreaking havoc” on native marine life. “I am trying to look for a fortunate release, but can’t think of one,” Bauer said. It was a misplaced screen that caused the release of the tiger shrimp from the Waddell facility in 1988, said the facility’s manager Al Stokes. They halted the breeding of tiger shrimp for food after that incident, though they still keep a small number of the species on site for research purposes. In fact, due to high cost of importing larvae from Asia, farming for tiger shrimp now exists at only one remaining spot in the U.S: Hawaii’s Oceanic Institute, Stokes said. While commercial fishermen caught a few tiger shrimp off the coast of South Carolina, Georgia and Florida in the immediate aftermath of the 1988 release, they were mostly absent from the Gulf until 2006. David Knott, a retired marine biologist who formerly worked for the Marine Resources Research Institute in South Carolina, thinks most of the tiger shrimp in today’s Gulf and Southeast waters more than likely originated from the Caribbean and have migrated north due to warming waters. He adds that these animals slowly became established in South America off the coast of northern Brazil, then near where Belize meets the Gulf’s southern most tip, eventually migrating north to the Carolinas. 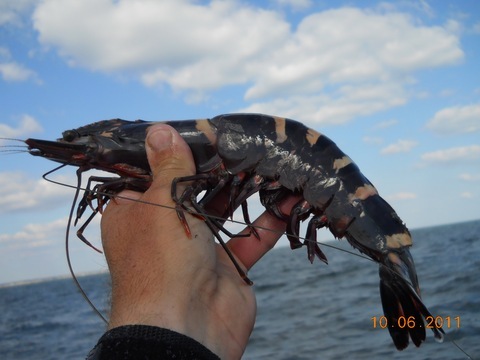 Citing data from NOAA, USGS and the state Department of Natural Resources, numbers climbed steadily over the years, Knott said, from six tiger shrimp reported in 2006 to 678 reported in 2011. But then they dropped off, with 207 reported in 2012 and 196 reported so far this year. Knott thinks the decrease in 2012 more likely reflects reporting apathy than a decrease in Asian tiger shrimp numbers in the Gulf. The shrimp isn’t entirely unwelcome. It carries more tail meat than a lobster and has been popping up on local menus, such as the Millhouse Steak House in Brunswick, Ga., which serves them up with Creole seasonings, Cajun cream sauce and broiled tilapia. And people interested in chomping down on the creatures arrive at shrimp docks willing to pay the extra bucks to take them back to the grill. But many scientists, such as Morris, remain concerned. Invasive species are bad things, he said, disruptive to both biodiversity and the economy. Correction: Earlier versions of this article incorrectly identified Lindsey Parker and David Knott’s positions. Parker is a marine resource specialist with the University of Georgia’s Marine Extension Service. Knott is a retired marine biologist who formerly worked for the Marine Resources Research Institute.